Who are you working with at the moment? 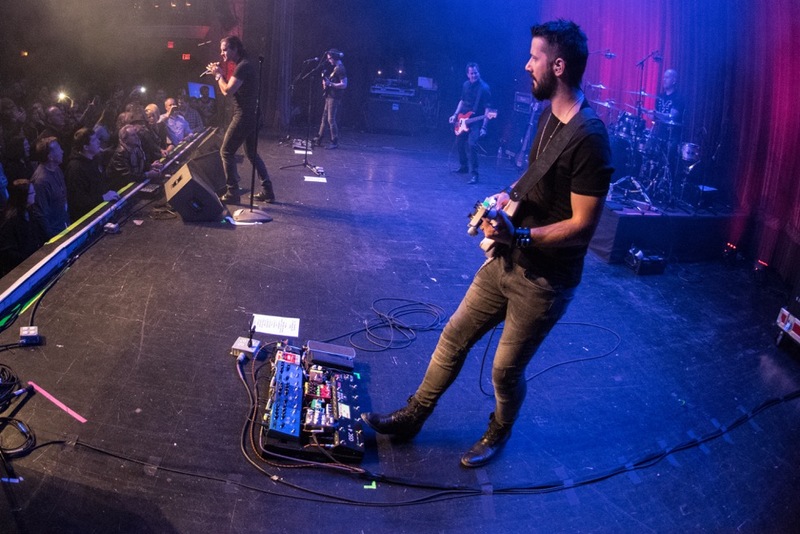 A couple of months ago, I joined forces with the legendary Scott Stapp (Creed) as the lead guitarist in his band. The songs are great, there's a great atmosphere in and out of the studio and our chemistry is explosive during live shows! I really dig the fact that I have the opportunity to perform few of my favourite songs, with heavy guitar sounds and solos, but at the same time I have the space I need in order to use atmospheric effects and create a unique vibe for each tune. What kind of work do you get the most satisfaction out of? I love working at the studio but I also enjoy the high adrenaline live shows. Each one has its own satisfactions. Studio work usually gives you the freedom of creativity and I believe that orchestrating and composing songs for different artists can be a unique and challenging experience. On the other hand performing live and interacting with the audience has a great impact to me. I always love when people are singing, when they close their eyes and dream of listening to the music. That's a pretty strong feeling which is irreplaceable. Tell us a little bit about your solo work? Apart from working as a session player, the solo part of my career is quite busy too. I do clinics and master classes covering various topics; from technique and improvisation to recording and management. Moreover, I work with Jamtrackcentral doing instructional DVD packages. At the moment I'm working on my second 20 licks package. Also, I'm in the recording process of my first cd. This is a project that has been going on for some years now and I keep postponing it's release until I feel the time's right to release it. My goal is to release it near the end of 2017. I've put all of my creativity and knowledge in there, each one of the songs represents a different part of my personality and I would be glad to see the audience embrace it and feel expressed by my music. Can you pick out a favourite gig? My favourite gig so far was one show a couple of years back at the river party in Nestorio, Greece. 35,000 screaming people in front of a stage near the Nestorio River among the trees carved that gig in my memory. The most recent favourite show was one we played with Scott Stapp at St. Charles, Illinois! I liked very much the venue (Arcadia Theater) and the crowd was amazing!! Who do you count among your musical influences? The guitar hero of my youth was Slash, but my first real love was John Petrucci. As soon as I evolved technique wise and started working more on my improvisational skills I soon discovered John Mclaughlin, Allan Holdsworth, Joe Bonamassa, Frank Gambale, Marty Friedman and Brett Garsed among others. In my eyes music is a combination of melody and good technique, a balance between power and emotions. Each one of these guys has embodied both aspects in their solos but in a totally different way. That would definitely be the 90s. Great bands popping form every corner of the earth producing records that made history and shaped the sound of rock and metal as we know it today. No brainer here! My first guitar was the Steve Vai signature model from Ibanez. Exceptional guitar, particularly beautiful and very easy to play! I was very fond of it until I played a PRS custom 24 and that's when I fell in love with PRS guitars. What guitars are you playing at the moment? I'm endorsing PRS guitars and I've been using the custom 24 model, for all my life. The reason I love them is because they have a killer sound, unique construction quality and they are easy to play. Also, they are extremely versatile, work equally well both in studio and live applications and the tops and the inlays they have are just gorgeous. Guitar wise I believe that's the way to go, that's my sound. Tell us about your Strymon Big Sky, Mobius and Timeline, what made you chose them? From the first moment I heard the Strymon pedals I was shocked. All the effects sound so alive, they have an amazing color, and I believe they are exactly what I hear inside my head. During a set I like to programme many different sounds for each song and the Strymon pedals support this kind of versatility. The fact that are MIDI controllable is a key factor plus you have tons of different effects to choose from and can adjust numerous parameters. All these give you a palette of colours to choose from. I believe they are must in any player's pedalboard, no matter the level or experience. These pedals breathe music! Also I've used them in studio applications with great amazing results! They sound "big" inside the mix, they blend well with the guitar tone and can be used for any kind of music from pop to heavy metal, that makes them a must for studio session players. Finally apart from the tone quality they are also built to last, each one of them is built like a tank without being too heavy, so no worries about travelling and heavy gigging. 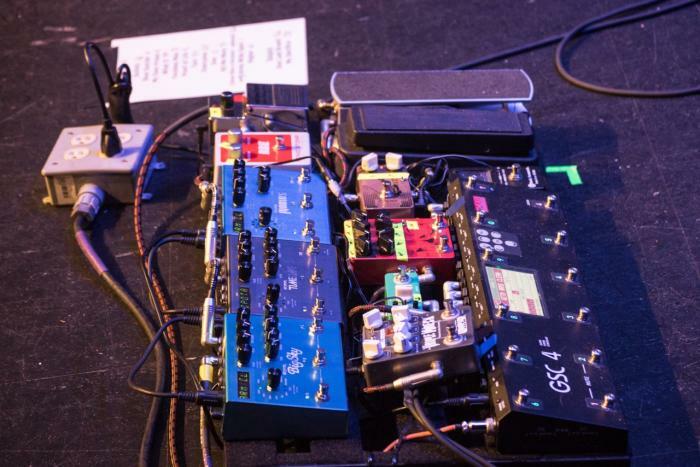 In other words, the Strymon pedals incorporate everything any musician could ask for. All of the effects I use come from The Strymon Timeline/Big Sky/Mobius. Apart from these, I have an Ernie Ball VP JN, a Tsakalis Zipper compressor, ISP decimator, Tsakalis Nerve MKII, Mooer Green mile, Wampler Triple Wreck, BBE sonic Stomp and a Peterson Stomp Classic. 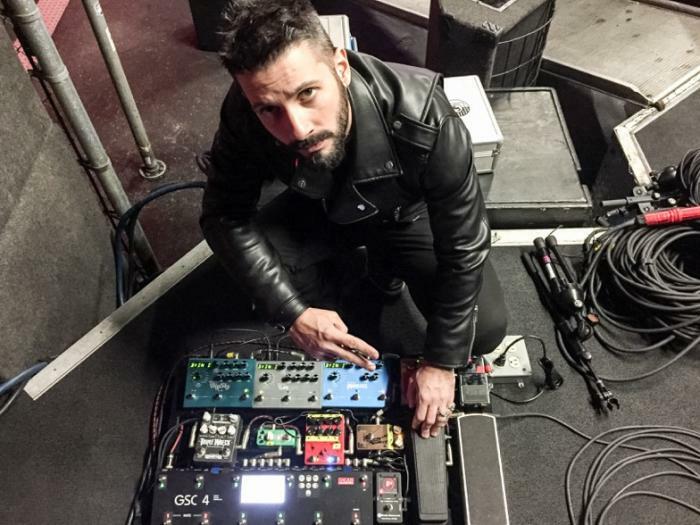 I use strictly Mesa Boogie amps and in order to control these I use the GSC-4 controller by G-lab! Is there anything you have parted with that you really miss? I really miss my Mesa Mark IV head, I gave it to a friend a couple of years back in exchange for a Mesa Triaxis. The fact that I have the Mark IV voicing in the Triaxis and the fact that my friend takes a good care of the amp makes me happy, but still that was one of my favourite pieces of gear. Can you think of anything that really changed things for you? I believe the first answer would be the PRS guitars since it's the first means my hands use to make music. Getting away from that, one piece of gear that has been with me since day one and I really like is the TC Electronic G force. Great piece of gear with so many and good sounding effects in a rack unit. I actually put it on the shelf when I heard the Strymon pedals for the first time! My advice would be to listen to the music inside your head and learn how to express it though your instrument and your gear. Never stop working and don't be afraid to experiment! The only limitation is our imagination!